Situé sur une acres de propriété, à quelques minutes petite ville de pahoa avec des restaurants, supermarchés et magasins healthfood. Volcanique piscine chauffée (étangs chauds) à environ 10 minutes (un seul sur toutes les îles hawaïennes). 30/40 minutes de Hilo et parc national des volcans. Nouvellement construit, avec le teck et les planchers de tuiles, des incrustations de granit, de marbre, piliers de cèdre odorant et bains balinais exotique privé pour votre usage exclusif. Plus belle que les photos peuvent montrer. Sentez-vous libre de me rappeler sur mon cellulaire au 808 937-6667 pour répondre aux questions. Eliot was there to greet us and show us around the house and property. We enjoyed the unique vibe the Temple House provided. Outdoor bathroom and bath house was kind of cool. Location was close to town and good restaurants. We enjoyed our stay. Beautifully decorated guest cottage in a garden setting in a secluded location. Eliot was very helpful. Elliot is a gracious host and quite an interesting soul. The home/temples he built are a reflection of a true visionary. Better in real life than in pictures. It is better in person than in pictures, the only negative I have is the bed is a bit firm. My stay at Eliot’s guest home was wonderful. The space was just as advertised, even better! From the moment I arrived I was struck by the beauty and serenity of the environment, both inside and out, with every detail pleasing, from the sculptures and intricate designs, to the rich color schemes, and solid, comfortable furniture. The guest house is its own separate dwelling---private, spacious and clean. 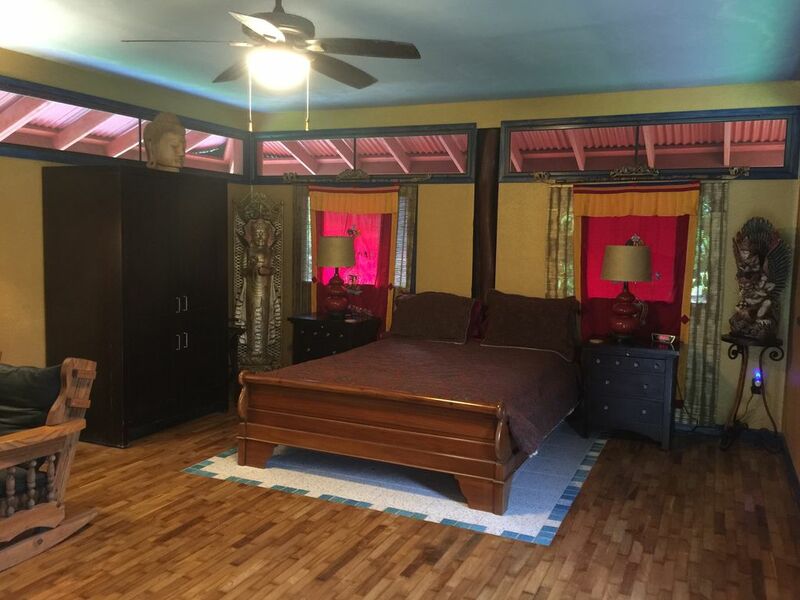 It was beautifully decorated and furnished and convenient to many activities like the lava flow, natural coastlines, volcanically heated thermal pools, and the local town of Pahoa. I stayed there after taking a lava boat tour, and it provided the perfect ending to a perfect day. The living space was warm and inviting, and I immediately felt at home. I had traveled to Hawaii alone and felt completely safe there. Eliot greeted me when I arrived and provided a quick introduction to the features of the home, gave great suggestions for activities and places to eat, and then graciously retired to his own home on the property. He was helpful but unobtrusive. I loved the sense of solitude and proximity to the natural environment provided by the design of this guest house. The screen windows allowed natural sounds to permeate the air. It was wonderful to hear the rain and breeze rustling through the trees as I fell asleep. The bed was large and comfortable and I got a great night's sleep. In the morning I sat on the patio sipping my coffee and enjoying the lush plants and vibrant sunlight streaming through the trees--- so relaxing. The bathroom, while attached to the house, is accessed from the outside. It is an interesting design feature, and the roof overhang protects you from any rain. The bath house is its own separate cozy little structure a few paces away from the house, set amidst lush foliage and a small water garden. I really enjoyed this feature. You have the option of keeping the blinds closed for added privacy; however, I opened them up to allow natural light and greenery to surround me as I showered, and the cool breeze floating through the screened windows caressed my skin while I dried off. It was delightful! Definitely a good experience of local Hawaii. I wish I had booked more nights at this place as it was by far the best accommodation I had on this side of the island. Thanks, Eliot, for creating such a nurturing and comforting environment for your guests! House is unique and tasteful like a temple but also cozy and comfortable. Quiet, private, and clean. The owner Eliot was accommodating and very nice. The town of Pahoa is within a couple of miles. It is quaint and has great restaurants and shops to explore. We had a great time! The warm ponds are a short distance down (famous for it's beauty) Red Dirt Road. They are the only volcanic heated pools in all seven islands. A great place to swim, relax, and have a picnic. I would definitely stay there again and highly recommend it. For such a great place it was a real bargain. My brother and sister-in-law stayed there awhile ago and they are going to stay there again on their next visit to Hawaii later this year. I would give this place five stars! I was great to have you here. I hope you can stay again here..